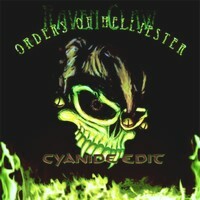 The Finnish band is releasing demos quite frequently and if you wander about the title, they already had a demo titles Orders Of Helljester, but this is the new one - the cyanide edit. The first track is called Slaughter Them All and shows the sextet with a melodic death metal track. The keyboard of Sami Partanen adds a neo-classical / symphonic touch while guitarists Joonas Pulkkinen and Jere Póyhönen add some riffs based in traditional metal. Singer Henry Hämäläinen varies between growls, scolding parts and harsh clean vocals. The harsh vocals remind me a bit of his fellow countrymen Alexi Laiho...Later in the song they slow down and offer a doom part with deep growls... An interesting mixture, even if I personally don't like the scolding vocal parts. The 2nd and last track of this demo is called Sip From My Cyanide. Heavy riffs dominate the symphonic keyboard - and again the scolding vocals. In my opinion growls would have fit better... Would have add heaviness. Due to the vocals this is a melodic death metal tune which a black metallic touch. The guitar play is influenced by traditional metal. Slaughter Them All offers more variety and so is more interesting, especially as both tracks are about 6 minutes and Sip From My Cyanide is so a bit too repetitive. Personally I would prefer different vocals or more variety, but that's a matter of taste. The sextet presents well played songs, a mix of different elements and freshness. The Finnish sextet head into this 4-track demo with Nocturnal Atmosphere, a fast melodic death metal tune which an almost catchy hook line. The sound is raw like at some black metal stuff... The keyboard of Sami Partanen also give it a touch of symphonic black metal, but they are more in the vein of their fellow countrymen Children Of Bodom. At Helljester's Path they is tending more to symphonic black metal with some death metal-like growls. The guys really offer some variety! Partly the guitars echo the keyboard melody, quite cool! Jere Pöyhönen and Joonas Pulkkinen are responsible for the heavy, precise riffs and the melodic lead parts. While Henry Hämäläinen handles the vocals - which range from almost clear vocals to growls, grunts and scolding parts! And this path they follow with Helljester's Path. Towards the end they have a heavy, melodic part which is catchy and has a folk touch. The last track kicks off slowly with keyboard... The gets heavier, but stays quite melodic and differs a bit from the others, even if there are some growls... But it shows Raven Claw a bit different. Very cool.